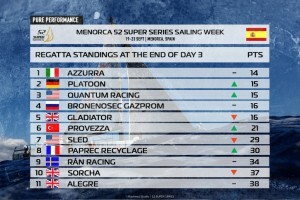 (Thursday 21st September, Menorca) – With the wind moving round today into a more reliable, dependable southerly direction, defending 2016 52 SUPER SERIES champions Quantum Racing bounced back from a modest, frustrating start to the season’s final regatta – the Menorca 52 SUPER SERIES Sailing Week – to return two second place finishes today and restore their pressure on title rivals Platoon and Azzurra. 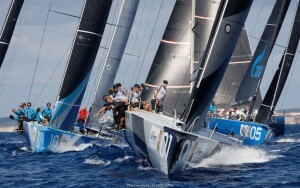 While Quantum Racing’s four points aggregate for the day was the best, most consistent scoreline of the day, nemesis Azzurra were always in fightback mode, albeit relatively successfully, while Harm Müller-Spreer’s Platoon won the first race, but could only make a sixth from the second windward-leeward contest. 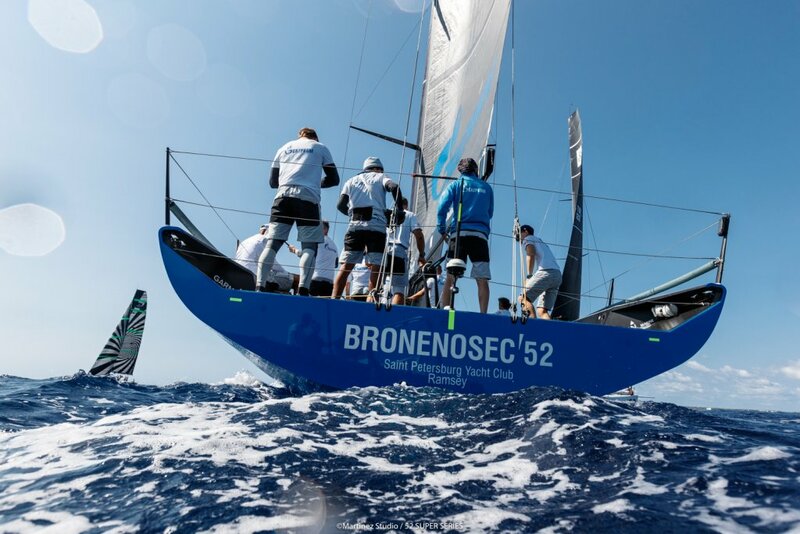 The net gain for the day was to the current champions Quantum Racing who have now closed back to be nine points behind Azzurra. And while Terry Hutchinson’s demeanour on the dock was somewhat brighter than yesterday when they went from first to seventh, this time it was his Latino rival Vasco Vascotto who was visibly frayed around the edges when he came ashore. In the first race Platoon started at the signal boat end of the start line to windward of Quantum Racing and Azzurra and were able to lead around the top mark from Quantum Racing. As the wind eased, Quantum Racing closed right back into Platoon at the second windward mark, requiring the German-flagged team to double tack up to defend just before the last turn, but Platoon were able to hold on to take the winning gun. Ironically, for the team that has been one of the most consistent this season, this was the first win since Miami for Müller-Spreer’s crew, one which actually has four Olympic medallists in their line up: John Kostecki (silver 1988), Jordi Calafat (gold 1992), aft grinder Martin Kirketerp (49er gold Qingdao) and coach Morgan Reeser (silver 1992, behind Calafat). 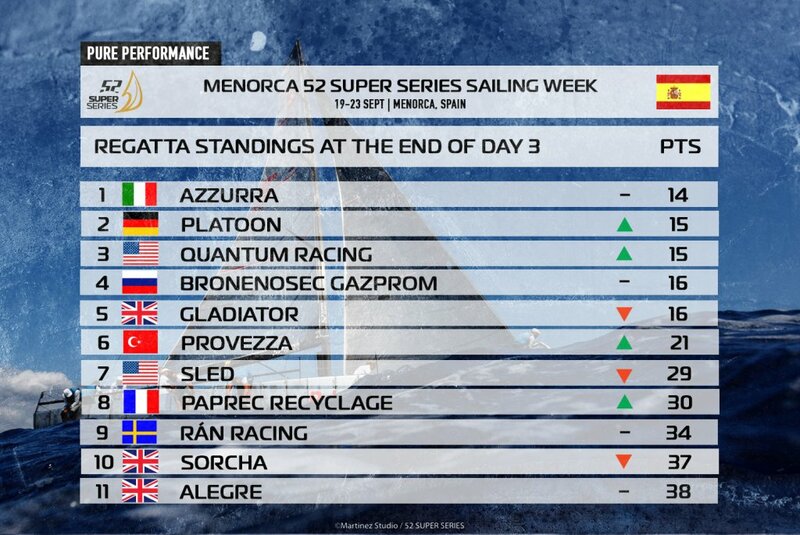 Platoon struggled in the second race of the day and were not able to effect the same kind of fight back that Azzurra did. Bronenosec, with Francesco Bruni and Morgan Larson, worked well together, made hay on the left of the first upwind and were able to lead Quantum Racing through the finish line to score their second win of the regatta. It was on the second, shifty downwind that most of the place-changing occurred among the middle order, Rán Racing dropped from third to eighth, Provezza’s up and down progress saw them up to fourth at one point having been all but last on the first circuit but the Puerto Portals winners then fell down to seventh by the finish line. But these shifts and changes in pressure spelled opportunity for Vascotto and the Azzurra team who crept up from seventh to cross third, just behind Quantum Racing. On 52 SUPER SERIES TV Live today, the CEO of the 52 SUPER SERIES Agustín Zulueta confirmed he expects there to be eight new build TP52s on the 2018 52 SUPER SERIES circuit, anticipating the return of Brazilian owner Eduardo de Souza Ramos who is building a new boat, while several America’s Cup teams have had representatives in Mahón. or are expected to visit Menorca over the final days of the season.